As most people who regularly read this blog will have realized, I’ve quite an eclectic taste in music. Over the years, I’ve explored and enjoyed all types of music. One of these genres I discovered over twenty years ago, is world music. Whether it’s Latin, African or Caribbean music, I’ve explored and enjoyed it. So, you imagine my delight when I received the forthcoming album from Los Transtlanticos, First Trip, which will be released on May 28th 2012 on BBE Music. The story that leads up to the release of Los Transtlanticos is an intriguing and fascinating one. At its heart, is a friendship between two men who shared a common bond. This common bond was a love of Caribbean music. Six years later, this friendship and love of music would lead to the release of Los Transtlanticos’ debut album First Trip. Before I tell you about the music on Los Transtlanticos’ album First Trip, I’ll tell you the story behind Los Transtlanticos and their debut album First Trip. The Los Transtlanticos story starts back in 2006, when Dean Bagar, a Croatian born, but Berlin based DJ, producer, record shop and record label owner visited Bogota. There he met Pablo Gaviria, a music producer who previously, has worked with Bamba Estero and produced Pulenta. Quickly, the pair formed a friendship, with their common bond a love of Caribbean music. After this, Dean started making regular visits to Bogota, where he and Pablo started recording jam sessions in a local studio. Soon, Pablo’s brother Alvaro Gaviria, an instrumentalist, would then join the pair. Alvaro is a musician whose worked with an eclectic selection of artists, everything from hip-hop to Ethiopian-Australian punk rock. Eventually, the next step for the trio was the formation of a band. Dean, Pablo and Alvaro’s nascent band would become Los Transtlanticos. The reason for the name, was not just the distance between the musicians, but their musical approach. Together with a number of Columbian musicians and singers, their new band Los Transtlanticos was born. Los Transtlanticos made their debut in Berlin, at the Worldtronic Festival in December 2011, where they received an enthusiastic and enraptured response from an enthralled audience. From there, Los Transtlanticos would record their debut album. Now that Los Transtlanticos had recorded their debut album First Trip, it will be released by BBE Music May 28th 2012. Before that, Mi Sembado will be released as their debut single, while they’ll soon be releasing their first music video. It was filmed in concerts in both Berlin and Bogota, the two cities that have proved so important in the Los Transtlanticos story. However, six years after Dean and Pablo formed their transatlantic friendship, Los Transtlanticos debut album has been hugely anticipated. Thankfully, I’ve been given a sneak preview of First Trip, and will tell you about some of the tracks on hopefully, the first of many albums from Los Transtlanticos. My first choice from Los Transtlanticos forthcoming debut album First Trip, is the track that opens the album, Moving Up (Se Me Siento Fine). Featuring Freddy Livingston, Pina and Doggy Fresh, it’s track fusing styles, sounds and influences. Straight away, you hear an eclectic and intriguing combination of instruments and influences. Stabs of guitar, brief bursts of rasping horns, percussion and vocals are contrasted by old school synths, which reverberate above the arrangement. Here, it’s a fusion of traditional Caribbean music, reggae and hip-hop, with Latin music even making its presence felt. Then, when the impassioned, vocal enters, it’s delivered by Freddy in a style that mixes hip-hop and reggae. As his vocal drops out, it’s replaced by a vocal that’s delivered at breakneck speed, while Pina adds subtle backing vocals. When Freddy returns, the track meanders along to its dramatic, dub drenched ending, getting First Trip of to a rapturous, rollicking start. Mi Sembrado is a mid-tempo track with a much more traditional sound, albeit given a twist by Los Transtlanticos. Here, Victor Daril, a.k.a Mr. Baba, an M.C. and singer is in charge of the vocal, while R&B, soul singer and tango dancer Juliana Valentina, known as Liana, augments his vocal. An accordion, percussion, piano and pounding drums combine, before lilting backing vocalists join in. Above the arrangement is Mr. Baba’s vocal, delivered in am M.C. style where hip-hop and Jamaican toasting unite. This he does against a frenzied backdrop, where a multitude of tantalizing and mesmerizing sounds reveal their charm and beauty, on a track where traditional and modern Caribbean music unite as one. Edna’s Delight features Edna Orozco and is a track where a traditional and more moderne sound meet. Here, a pounding rhythm section, woodwind, percussion and accordion combine, while stabs of organ augment this combination. The more moderne influence see bursts of squelchy, old school synths, dubby drums and vocals drift in and out of the tracks. It’s a real fusion of old and new Caribbean music, with bursts of Acid house era synths augmenting and complimenting this fusion. Together, they combine to create a sound that’s variously haunting and enchanting, but beautiful and bewitching. On La Receta, we get another opportunity to hear the beautiful sound of Liana’s vocal. Here, she plays a bigger part in the track, and is joined by DJ Galletas Calientes and Mr. Baba. Like so many tracks on First Trip, it’s an amalgamation of talents and styles. Liana’s vocal is soulful, while Mr. Baba M.C.’s delivery is powerful, confident and dominates the track. Meanwhile, the rest of Los Transtlanticos provide a joyous backdrop that fuses traditional Caribbean music, with bursts of soul and reggae. This is not only hugely catchy, but absolutely irresistible and guaranteed to brighten up your day. Alone I Am is a track that fuses a moody, broody arrangement with a half-spoken vocal from Benjamin Benjam. It’s more like a Nu-Jazz-tinged soundscape complete with lyrics from Tom Waits, and unlike anything that’s gone before. However, that’s what makes this such a compelling and intriguing track .A pounding bass that tests your speakers to their limits, combines with a myriad of woodwind, drums and Benjamin’s half-spoken vocal. The track has an almost hypnotic effect, drawing you in, resulting in you hanging on Benjamin’s every word. When this is combined with an arrangement that fuses an eclectic selection of sounds, the result is a track that’s compelling, intriguing and utterly enthralling. Cartasal Asecho is the complete opposite of Alone I Am. Whereas, it was moody and broody, Cartasal Asecho featuring Liana and Doggy Fresh has a joyous, uplifting sound. This is thanks to the combination of Liana’s impassioned, emotive and soulful vocal, accompanied by acoustic guitars, percussion, handclaps and backing vocalists. Add to this, a myriad of scratches, stabs of piano and Doggy Fresh’s rapped vocal. Here, hip-hop, Caribbean music and soul are fused seamlessly, on a track that’s joyful, numinous and beautiful. Shimmering, cascading strings, percussion and haunting screams combine with Mr. Baba as Keep On Growing unfolds. That’s just a curve ball, because what follows is a delectable combination of Caribbean rhythms, Mr. Baba’s MC-ing and the soulful sound of Liana. Again, Liana and Mr. Baba at the heart of everything that’s good about this track. Between them, they inject energy and hope into the track. Meanwhile, behind them, the arrangement sees pounding drums and percussion key to a track that has everything that’s good about Caribbean music, plus elements of hip-hop, reggae toasting and soul thrown in for good measure. All this is mixed together by Los Transtlanticos into a delicious, rhythmic soulful stew. Donde Esta Marie is my final choice from Los Transtlanticos’ debut album First Trip. It’s a joyful explosion of uplifting, feel-good music. This is music for the heart, feet and soul. For just under three irresistible minutes, the music sweeps you along in its pounding, impassioned wake. A proliferation of percussion and pounding drums are key to the glorious rhythms that unfold. Meanwhile, a punchy joyous vocal and a a frantic piano solo combine, before later, stabs of blazing horns join the party. When this is all combined the result is glorious, passionate track to lose yourself in, one that’s for the heart, feet and soul. Although I’ve only mentioned eight of the fifteen tracks on Los Transtlanticos’ forthcoming debut album First Trip, choosing just eight tracks wasn’t easy, given the consistently high quality of music on the album. From the first track Moving Up (Se Me Siento Fine) to the closing track LA 33’s, it’s a seamless procession from one quality track to another. During that time, the music is variously emotive, impassioned, enchanting and enthralling. Often the music is compelling, other times it’s bewitching and very often, it’s beautiful. It’s music that’s for the heart and soul, yet other times for your feet. On First Trip, Los Transtlanticos take you on a journey through traditional Caribbean while incorporating reggae, dub and Jamaican DJ toasting. However, it’s not only Caribbean music that features on First Trip, with soul, jazz, Latin and hip-hop all making welcome appearances. There’s even old school Acid House synths which feature on several tracks. 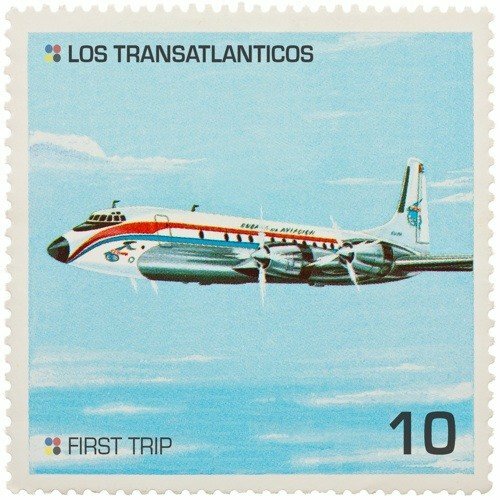 Truly, Los Transtlanticos’ forthcoming debut album First Trip is a truly compelling fusion of musical styles that once you’ve heard it, you’ll forever be enthralled by its subtleties, charms and beauty. It has an irresistible charm and a sound that’s joyous and is full of the most glorious rhythms. For anyone who loves Caribbean music of any kind, world music, dance music or just good music per se, then Los Transtlanticos’ forthcoming album First Trip, which will be released on 28th May 2012, is very definitely an album that belongs in your music collection. Standout Tracks: Edna’s Delight, On La Receta, Alone I Am and Cartasal Asecho.